In this article we describe our attempt to challenge our anthropocentric gaze during an outdoor environmental education (OEE) research project involving a 10-day journey with high school students on the Snowy River in south-eastern Australia. Although much contemporary OEE research explores place responsive methodologies that provide possibilities for expanding beyond human centered practices, such movements can be difficult to make. We attempt, through this project, to shift our gaze away from a human-centered viewpoint to understand ways in which new perspectives of journeys, place(s) and learning might be available. To do this we adopt a posthuman/relational materialist approach to explore how the material world is creative of places, people and learning opportunities beyond human centered ways of seeing. We argue for a focus on the more-than-human aspects of places and engage posthuman concepts that allow us to challenge traditional ways of researching. In doing so we seek to uncover and acknowledge the agency of the more-than-human world, and how material places and their elements are valuable in the creation of emergent learning possibilities on an OEE journey. Rather than exact findings, this article is an exploratory journey of thinking OEE in different ways, to explore new opportunities for place and context responsive learning and environmental understanding. We would like to acknowledge the valuable constructive feedback provided by the reviewers and the Editor, John Quay, in helping improve the clarity and quality of this article. We would also like to the thank the students from the Snowy River journey for their input into this research project. Bishop-Taylor, R. (2016). Every mapped stream and river in Australia. Retrieved from https://github.com/robbibt/australian-rivers#data. Clarke, D. A. G., & Mcphie, J. (2014). Becoming animate in education: Immanent materiality and outdoor learning for sustainability. 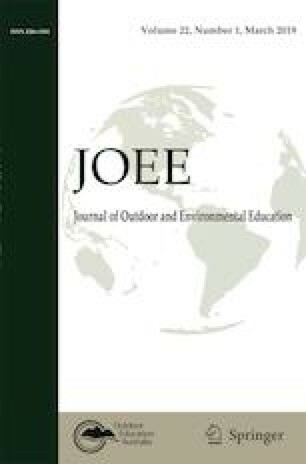 Journal of Adventure Education and Outdoor Learning, 14(3), 198–216. https://doi.org/10.1080/14729679.2014.919866. Clarke, D. A. G., & Mcphie, J. (2016). From places to paths: Learning for sustainability, teacher education and a philosophy of becoming. Environmental Education Research, 22(7), 1002–1024. https://doi.org/10.1080/13504622.2015.1057554. Denzin, N. K. (2013). The death of data? Cultural Studies↔Critical Methodologies, 13(4), 353–356. https://doi.org/10.1177/1532708613487882. Fox, N. J., & Alldred, P. (2015). New materialist social inquiry: Designs, methods and the research-assemblage. International Journal of Social Research Methodology, 18(4), 399–414. https://doi.org/10.1080/13645579.2014.921458. Hultman, K., & Lenz Taguchi, H. (2010). Challenging anthropocentric analysis of visual data: A relational materialist methodological approach to educational research. International Journal of Qualitative Studies in Education, 23(5), 525–542. https://doi.org/10.1080/09518398.2010.500628. Jackson, A. Y., & Mazzei, L. A. (2013). Plugging one text into another: Thinking with theory in qualitative research. Qualitative Inquiry, 19(4), 261–271. https://doi.org/10.1177/1077800412471510. Lynch, J., & Mannion, G. (2016). Enacting a place-responsive research methodology: Walking interviews with educators. Journal of Adventure Education and Outdoor Learning, 16(4), 330–345. https://doi.org/10.1080/14729679.2016.1163271. Rautio, P. (2013). Children who carry stones in their pockets: On autotelic material practices in everyday life. Children's Geographies, 11(4), 394–408. https://doi.org/10.1080/14733285.2013.812278. Sellers, W., & Gough, N. (2010). Sharing outsider thinking: Thinking (differently) with Deleuze in educational philosophy and curriculum inquiry. International Journal of Qualitative Studies in Education, 23(5), 589–614. https://doi.org/10.1080/09518398.2010.500631. St. Pierre, E. A. (2013a). The posts continue: Becoming. International Journal of Qualitative Studies in Education, 26(6), 646–657. https://doi.org/10.1080/09518398.2013.788754. St. Pierre, E. A. (2013b). The appearance of data. Cultural Studies↔Critical Methodologies, 13(4), 223–227. https://doi.org/10.1177/1532708613487862. Stewart, A. (2015). Rhizocurrere: A Deleuzo-Guattarian approach to curriculum autobiography. International Journal of Qualitative Studies in Education, 28(10), 1169–1185. https://doi.org/10.1080/09518398.2014.974719.